We got up early and left the hotel before six o'clock to drive to the railway station. Fog covered most of the city. Traffic was heavy coming up to the railway station even in the early morning, and in the typical Indian style, going in all directions to get to the destination. Patience and allowing plenty of time are needed. We reached the station well before our train's scheduled departure at 7 o'clock, but there was bad news. Due to the weather our train was delayed for three hours until 11 o'clock. Our guide decided to take us to a hotel nearby for a coffee and a rest. By 9 o'clock we got a message that our train was further delayed until 2 o'clock in the afternoon. We knew by now we were not going to be able to make the connection with the famous toy train from Kalka to Shimla and the alternative way, to drive from Kalka to Shimla. taking about three hours would be necessary. We presumed the train from Delhi to Kalka would now definitely run at 2 o'clock so we would still manage to arrive in Shimla by 9 or 10 in the evening. In order to pass the next few hours before going back to the railway station for the train at two in the afternoon our guide took us to the famous Sikh temple Gurdwara Bangla Sahib which was nearby. Like all Sikh temples you are required to take off your shoes and socks and also cover your head. The next step is to wash your hands from the water tap and step through the water channel between the ground and the first step of the staircase going up to the temple. Since we did not have headscarfs to cover our heads our guide asked us to pick the used one from the box that people use for free. I left my hat in the car so I had to use one of these, but it is best to remember to bring your own headscarf with you when visiting Sikh temples. We returned to the railway station in the afternoon and saw that the delayed train was still scheduled for 2 o'clock departure. This was good news and we were also encouraged by the fact that more people were arriving at the platform and waiting for the arrival of the train. Our guide stayed with us until the train eventually turned up at two o'clock and even got on the train with us to locate our allocated seats. He waited until the train began to move before jumping off onto the platform and fortunately landing safely. We were in the first class compartment which was about the same level of comfort as the standard class in European trains. Our guide told us that lunch was included on the train. We were given a bottle of water and a portion of rice with dhal (lentil curry) each on a tray followed by a cup of hot tea and a small pack of biscuits. I enjoyed it because it was a typical local Indian style rather than a cold sandwich Western style. It was a slow train stopping and going through many villages and towns on the way. 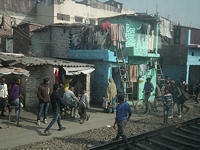 The rural landscapes and cityscapes began to unfold outside our compartment window. The most unique feature was the houses and people living so close to the railway line that our train went right past their front doors and shop fronts also. People carry on their daily life, some people still walking on the other track while our train is passing through. It seems so natural that it is part of their routine daily life. This kind of real life picture is part of the joy of travelling on trains in India. The train eventually arrived at Kalka at around 7 o'clock in the evening. It was later than we expected due to a lot of delays along the way. A few visitors like us were anxious whether we could connect the onward journey but I could see that most local people were calmer as delays are expected and part of travel. Luckily our local guide for this Northern part of our journey, Sandeep, was waiting on the platform for our arrival. Quickly we moved to the car but could not drive away as another car was parked blocking us. The driver went back to the crowded station and found the driver of the offending car so that we could begin our three hours journey to Shimla. Our driver was amazing to be able to locate the other car driver so quickly, and he turned out to be an excellent driver who was with us for the next few days. The three hour car journey was mostly uphill climbing up into the foothills of the Himalayas towards Shimla. 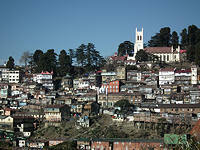 We stopped in one of the local towns on route for a short break, arriving in Shimla before 10 o'clock. We checked in at the 5* Oberoi Cecil in a bit of rush in order to catch our late dinner before the restaurant closed at eleven, but there were several other late arrivals like us from the delayed train journey and there was plenty of delicious food at the buffet. The first impression of this hotel was very good. The room was large with a sitting area of sofa and table as well as a nice desk. All the rooms are located surrounding a central atrium, with the lounge and bar in the middle. The restaurant was elegantly designed at a lower level with tall windows looking out to the gardens. 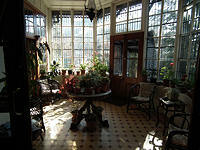 It was especially pleasant at breakfast too with beautiful sunlight shining through the windows and corridors. The buffet dinner that first night was good and also to the same standard the next night. We are going to use this hotel in our Deluxe hotels category. 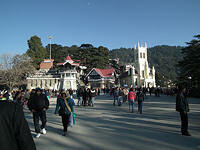 Next morning we explored Shimla town. 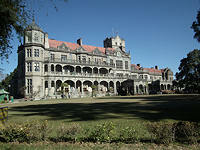 We started our tour by walking from our hotel, the Oberoi Cecil, to the Viceregal Lodge. It is a lovely walk of about thirty minutes through quiet roads and paths through woodland with views over areas of Shimla town below. As the lodge came into view it was like arriving at a Scottish castle. We joined the hourly tour of the those parts of the lodge which are not now used by the Indian Institute of Advanced Study. Our next stop was a very special old house in town, Chapslee, which has for many years also been operated as a small hotel by its owner. a splendid gentleman called Mr Ratanjit Singh. Although the house was closed as a hotel for its annual break, he was there to meet us. Born in this house and still living here, Mr Ratanjit Singh is a great character from an aristocratic family and his home is full of antiques and family history. The modest seeming exterior hides rather grand interiors full of antique furniture, vases, chandeliers, game trophies, tapestries and paintings. There are now five guest rooms/suites that were once occupied by family members. The décor remains as it would have been as a family house. 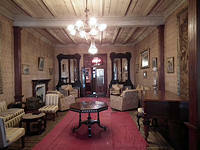 It will be quite an experience staying at Mr Singh's house and we will be offering it in our Special hotels category. 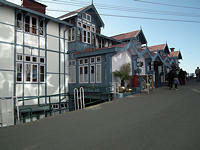 A new hotel clinging to the steep hillside of Shimla, the 4* Marina hotel. 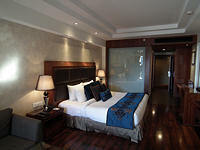 has particularly nice well-designed and luxurious rooms. This hotel has an excellent location just on the edge of town just a short stroll to the town centre with its shops, restaurants etc. We walked from the Marina hotel the short distance to another heritage hotel, the famous Clarks Hotel, a Shimla institution. 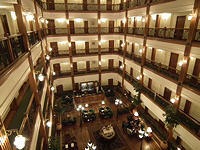 This classic hotel has large rooms, some with fireplaces. We are using both the Marina and Clarks in our Superior hotels category. 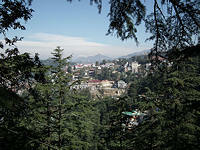 The landscape of Shimla town is best viewed from the area of Clarks Hotel. As we walked toward the centre the famous landscape of hillside houses with the white church clock tower made a spectacular panorama. We began our heritage walk through Shimla town, seeing on the way the Gaiety Theatre, the Town hall, The Post Office, Christ Church, The Ridge, Bandstand, Railway Board building and Gortan castle. We also walked through the busy street market of shops, stalls, tea rooms etc. full of local life and colour. Next morning we began our long 5-6 hours drive to Amritsar.